I had put out some "feelers" a while back to see if there was any interest in a series on cooking for the beginner. I received positive feedback, so I've decided to present some quick cooking tips through Two-Minute Tuesdays. I'm calling the series Cooking 101, and today is the first installment. 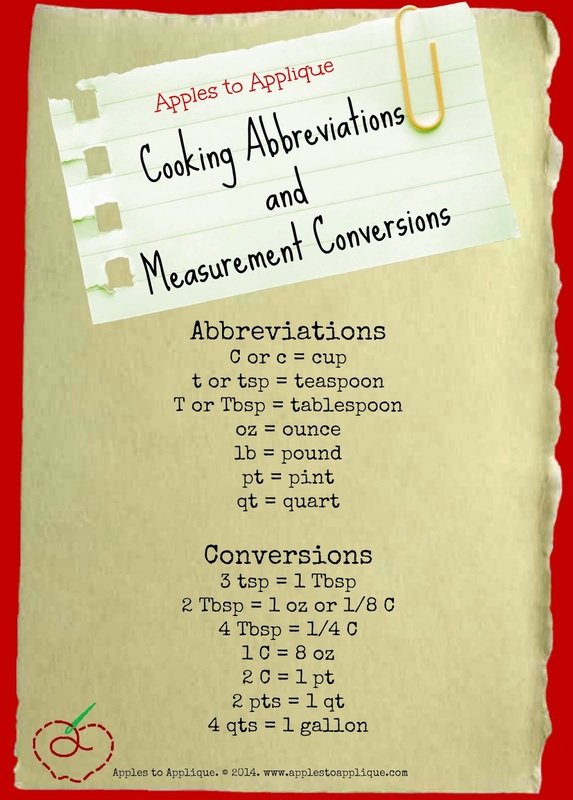 Of course, you can't do a series on beginning cooking without going back to the very basics, which is what I'm doing today, with an explanation of cooking abbreviations and a table of measurement conversions. I've created a printable for handy reference. Right-click the image below and select "download" to save the image to your computer and print it. The chart is pretty self-explanatory, but I wanted to point out one thing that new cooks often have difficulty with: teaspoons and tablespoons. Beginning cooks often get confused between these two when reading a recipe, especially if the abbreviations t or T are used. Here's a little trick to help you remember: a lower-case t always refers to a teaspoon, while a capital T always refers to a tablespoon. Or, as I like to tell new cooks, big T stands for the bigger spoon; little t stands for the littler spoon. So there's your tidbit for Tuesday! Enjoy the printable reference chart and stay tuned for upcoming cooking tips! Haha, I can never remember which is bigger a tablespoon or a teaspoon. This would have been handy this weekend when I was trying to make dinner and hadn't unpacked the measuring spoons! Haha, it's always an adventure trying to cook right after a move! I noticed that my quart pan is not accurate on the measurement dashes on the inside yesterday. It was disappointing to figure that out and yet it made my other cooking blunders make all the sense! Good reminder on equivalents. Ugh, how frustrating! It can sure mess things up if measurements are inaccurate. I used to teach Home Economics. I sure wish I'd had this pretty chart then. Great information! Thanks, Michelle! I'm glad you liked the chart. Thanks, I'm glad you found it useful! Very useful. I am always forgetting what is what. Thank you for making it easier.